This is another one of those pregnancy cravings I’m having for something that I’ve never had in my life. I am a lover of baked good and pastries and I loooooove me a good cinnamon roll, but I have made those enough that I wanted something the same…but different. 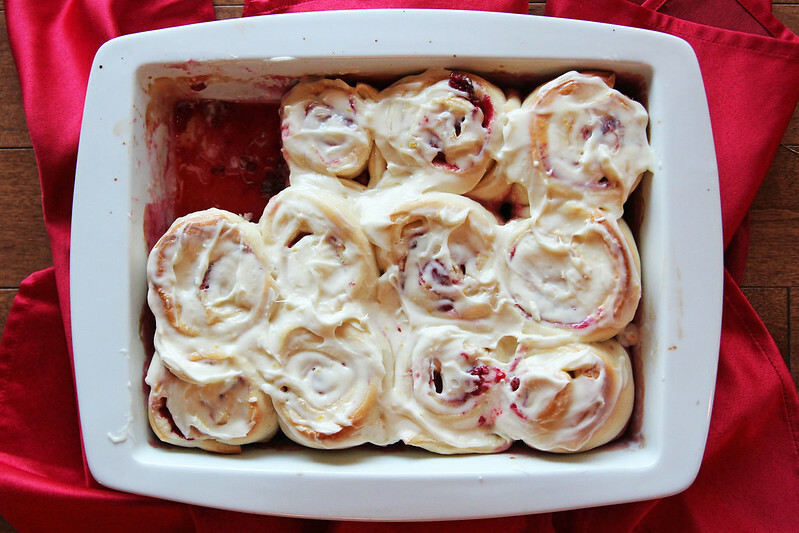 Low and behold, I come across raspberry sweet rolls, and I KNEW I had to make them! You should too! Mix yeast in 1/2 cup of lukewarm (not boiling) water; cover and set aside. In stand mixer bowl add shortening, sugar, and salt to hot water and stir until shortening has melted (can do this by hand); let cool to lukewarm temperature. Put dough hook on and stir in 1 cup of flour and until smooth. Add yeast/water mixture and mix until well combined, and then add in and mix the beaten egg. 1 cup at a time, stir in the remaining 3.5 cups of flour. Keep kneading dough with dough hook until smooth. Add a little more flour (1/4 cup) if the dough is still sticky. Once risen, remove dough from bowl onto clean surface and roll the dough into a rectangular shape. Drizzle melted butter evenly over dough and sprinkle with brown sugar. In a small bowl, carefully stir together the frozen raspberries, sugar, lemon zest and cornstarch and then spread evenly over the dough. Gently roll up dough into one long roll and cut in half. Cut the halves in half for 4 pieces. Cut each of those pieces into 3 equal pieces (12 total). 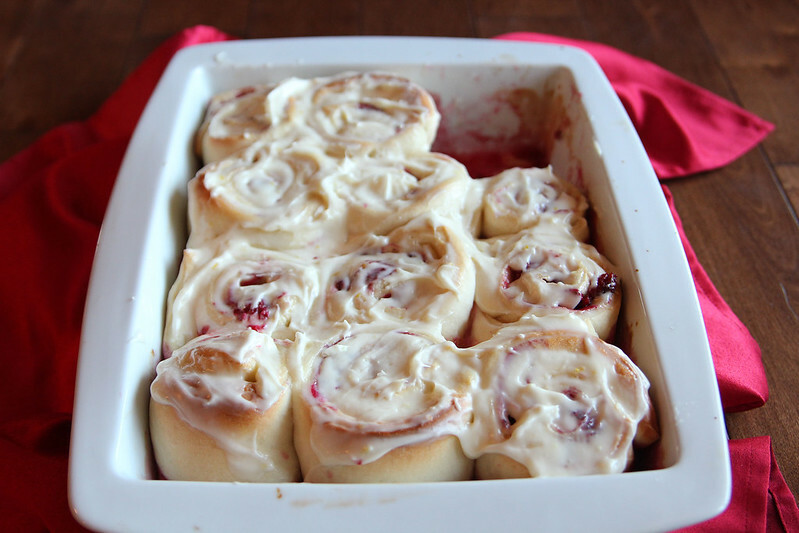 Place rolls into a greased 9″ x 13″ baking pan – I like to use melted butter. Place rolls in a warm spot and cover with a towel; set aside to rise until double in bulk, about 1 hour. Bake rolls at 375ºF for 18-25 minutes, until golden brown and centres no longer gooey. I know this range of cooking time is quite vague, but I do not like a doughy centre at all, so I tend to cook them on the longer side. Do whatever suits your needs! Let pans cool on wire rack and make the frosting! In a medium bowl, with an electric mixer, beat cream cheese, butter, powdered sugar and reserved lemon zest until smooth. Spread frosting on rolls and serve! Mix yeast in ½ cup of lukewarm (not boiling) water; cover and set aside. In stand mixer bowl add shortening, sugar, and salt to hot water and stir until shortening has melted (can do this by hand); let cool to lukewarm temperature. Put dough hook on and stir in 1 cup of flour and until smooth. Add yeast/water mixture and mix until well combined. Add in and mix the beaten egg. cup at a time, stir in the remaining 3.5 cups of flour. Keep kneading dough with dough hook until smooth. Add a little more flour (1/4 cup) if the dough is still sticky. Take dough out of bowl, spray bowl with canola oil spray, and place dough back into bowl and cover with a towel. Set aside to rise for 30 minutes or until dough doubles in size. Remove dough from bowl onto clean surface and roll the dough into a rectangular shape. Drizzle melted butter evenly over dough and sprinkle with brown sugar. In a small bowl, carefully stir together the frozen raspberries, sugar, lemon zest and cornstarch and then spread evenly over the dough. Gently roll up dough into one long roll and cut in half. Cut the halves in half for 4 pieces. Cut each of those pieces into 3 equal pieces (12 total). Place rolls into a greased 9"x13" baking pan - I like to use melted butter. *Place rolls in a warm spot and cover with a towel; set aside to rise until double in bulk, about 1 hour. Bake rolls at 375F for 18-25 minutes, until golden brown and centres no longer gooey. Let pans on wire rack. Now you can make the frosting! In a medium bowl beat cream cheese, butter, powdered sugar and reserved lemon zest with electric mixer until smooth. 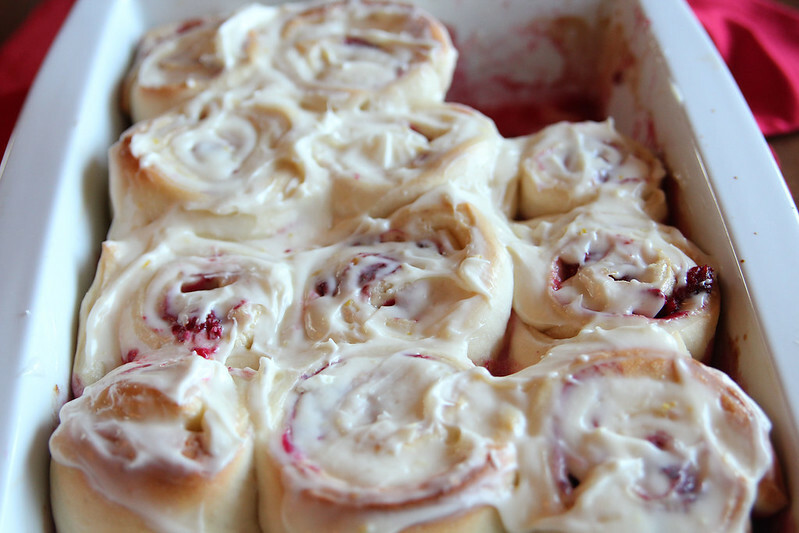 Spread frosting on rolls and serve! *At this stage I have also placed my rolls, covered, in the fridge for the night to bake in the AM. Baking took longer, the raspberries had thawed and were quite juicy in the bottom, but they still tasted great! If you want fresh rolls in the AM, I would recommend putting the risen dough in the refrigerator and rolling it out/assembling the rolls in the morning - that process really doesn't take too long! Doubles nicely for 24 rolls. Oh baby, these were so good! 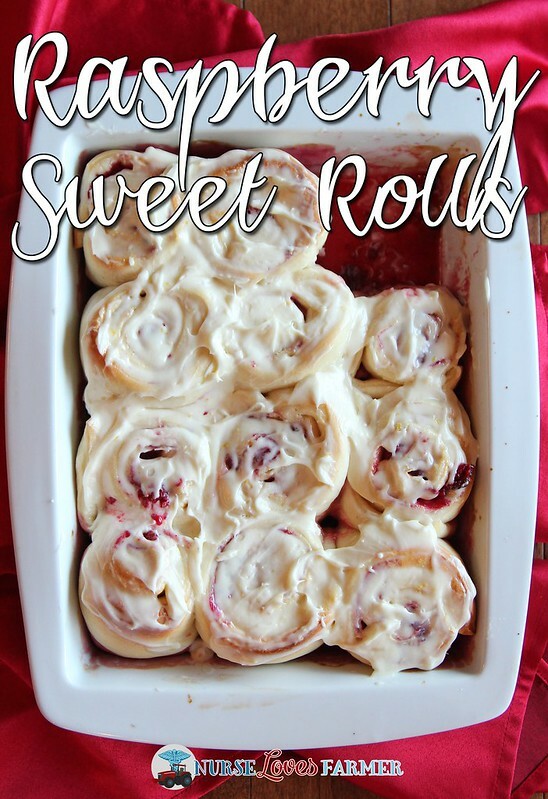 This recipe easily doubles for 24 rolls…I just didn’t need to tempt myself! Looks delish! Love raspberries. Will have to try.